If you want a most real XP feeling, why not try this. 5 different wallpapers, changing like programs have been started real. Transparent effect for the information area. MiniLauncher support. Even the help file works. On the right side you see the standard functions from dashboard. Where normaly the clock is, you can scroll pages. Every of the 5 standard functions has its own Wallpaper. While the Start-Menu is fixed the wallpapers change. The top of the screen is of course for the information. This space is made look like a transparent window. The price for the "Look and Feel" is, that the information aera is little small. But who cares. For the few private matters it will be enough. The whole story is rounded up with Wisbar support. As soon I get into mood I look for something Gigabar styled. Nice to see you busy again, Holgi. This one's pretty creative, but I'm not sure about the limited PIM space -- hard to keep track of my busy schedule! It is not made for your busy schedule. We both know that this "Look and feel" can not be accomplished without loosing information space. But for users having a handfull schedules, tasks and E-Mails, the space is shure enough. The rest of the PDA is full with games etc.. 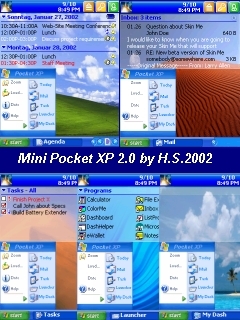 So the XP skin for PDA has the same effect then a WindowsBlind skin. Nobody has any advantage out of it, but the "Look and Feel" is all about it. You've definitely done the best job of getting that "look and feel," without a doubt. You should do a landscape version of this, though -- this concept would probably work best that way! Ver.2.1 has more optical improvements. Landscape is possible, I only don't know how many interest is in this.